For four years I worked every week in a remand center, a place where men and women waited for trial. Sometimes called PreTrial or Remand or simply jail, it’s always maximum security. I remember my first day there. Every door – I mean every door – in PreTrial was opened by someone in a control room on the first floor. To get to the library from the entrance, I had to stop at three doors, press a button, wait for a response, state who I was and then wait for the door to buzz open. Class was to be held in the library. Across from the library was a bathroom labeled Staff. I asked for a key – bathrooms are important for men in their sixties. Nothing doing. No key to the executive washroom for me. To use the toilet, I had to buzz through three doors and go to the staff room. Control monitored every hallway with a camera. This place was indeed maximum security. The residents or inmates lived on units. Each unit had some individual cells and some two-person cells, plus a small common living area. A unit held from twelve to thirty people. The prison didn’t allow any mixing of units because co-accused might get together and agree on their story. The authorities strictly enforced this separation. Some were there because their crimes were so serious, other, because they couldn’t afford bail. The door to the library – as all doors there – were heavy steel with a double window of unbreakable glass. A few minutes after the buzzer sounded, seven men in red suits stood at the door. I began to sweat. Why? I’d worked in a maximum security prisons before. What was so scary about these guys? Maybe all the steel doors had me spooked, maybe it was that they all wore red suits. I don’t know. The door buzzed open and in they came, excited, man-sweat smell. They all looked pale – not enough sun. Lots of handshaking and “My name is Tom,” and “We got a school here – finally. Shaun’s the name.” And so forth. I made coffee for the men and gave them pens and pencils. Other prisons pay men a nominal amount to attend class, but there was nothing like an incentive here, so I determined to at least save them the canteen cost for pens, pencils and paper. We talked about the GED as a high school equivalent. I told them I was a writer and we talked about that. Then I registered them one by one. Tom had been in PreTrial for six years. “Six years?” I couldn’t believe it. As a kid in school I remember learning that Americans had a right to a speedy trial. Maybe Canada was different. A perfect person for school. He gave me a cynical snark, as if I had just asked him if he’d like to go with me for a drink at an area pub. What could I say? I had no nostrum to give. I was to hear that over and over in the coming months. I registered the other two. Similar stories. I’ve changed the names and the stories slightly, but these were the men in PreTrial. I gave them an assignment to write about: a safe place they knew as a kid, and the program was off the ground. Lots of stories, but common to many of them was parental drinking and abuse. The old rule was proving true – bad parents, bad kids. Week after week I went back, every Thursday night. The numbers increased. I had less and less time with each student, but slowly I learned about PreTrial, the true and the false, the good and the bad. PreTrial is a short-term place where people are held while they wait for trial. Tell that to Tom who’s been there for six years. Canadian justice moves slowly, a good thing, I think. Fewer mistakes. But six years? The jail pharmacist did not give out an information page on prescribed drugs. When I go to my neighborhood pharmacy, I always get an information page on a new drug. People can die under this care – and they have. One doctor, however, is the exception. Everyone says he is a good and caring man. One night I buzzed control and said, “Five men to return to Hotel unit.” I had given them supplies, a cup of coffee and I had checked up on their study progress. I couldn’t do much more, because I had to see six units in one evening. No, I didn’t mean five inmates. First of all these men were not convicted. They were all awaiting trial. They were not convicts. But more important, I hate that word with a passion. “Inmate Jones, report to health care.” Day in, day out, men hear their names called out in this fashion. Not Mr. Jones, but Inmate Jones. What other institution does that? What is the long-term effect of reminding someone over and over that they are an inmate? I said nothing. The door did not buzz open. Time passed. A minute. I was involved in a war of wills – one I was going to lose. If I wanted to get the next unit down for school, I had to give in. But I thought up a compromise. “I have five to return to Hotel unit,” I said. There was a long silence and then the door buzzed open. In general supervisors seemed wiser and more humane than the guards. No universal statements apply to PreTrial. There are good guards and bad guards, good health care workers and bad health care workers, good residents and bad ones, too. What is true of PreTrial, as is true of all prisons, is that there is an Us and a Them. This is a poisonous atmosphere. No true help can ever be accomplished in such a setting. Jail is a place to dry out or to come down from terrible addictions. One man opposed my negative comments about jail. “Thank God for this place,” he said. “Without it, I’d be dead.” I tried to make distinctions, but he wasn’t having any. Jail is a place to meet old friends. Time and again the conversation drifted off to who knew who, who did time with whom in juvie. For some of these guys, jail wasn’t a punishment – it was old home week. Jail is a place to get hit in the head with a coffeepot by another guy who didn’t know how to control his anger. Time and again the public address system would call out “Code yellow.” The guards would run to whatever unit the code yellow was and quell the disturbance. Then the PA system would call out, “Stand down, code yellow,” like some pretend military camp. Sometimes people who were just minding their own business got caught in the middle of a fight. Actually, I’m surprised there weren’t more fights. Put twenty to thirty men on unit, men who had very little control over their emotions, keep them on the unit for twenty-three hours a day, lock them up for long periods, treat them like animals, make it hard for them to contact their families, have them endure the tension of long hours in a trial and you are going to have fights. What was the institution’s response to fights – counseling? take the pressure off? play some music? No. Their response was to put the instigators in segregation. No TV. In the cell twenty-three hours. No phone. No school. No privileges. No contact with others. Jail was a place to watch some good TV, the universal baby sitter of prisoners. I sympathized with men who enjoyed TV shows, but in another way it made me angry. The authorities were encouraging a generation of couch potatoes. Jail was a place to return to over and over, until one day the person woke up and said, “Enough.” But time and again I saw a man leave, his buddies would give him high fives and two weeks later he’d be back. One man told me that he and his buddies made bets on how long someone would be out and when they would come back. It was a sub-cultural ritual. We all know of cases in the news where people are in jail and, frankly, we’re glad. Can this PreTrial time be made better? What was billed as minor surgery for me last Monday, turned out to have a major effect on my ability to do anything this past week. My apologies. I promise to be up and running by next Sunday. Years ago I taught creative writing in a maximum security prison in the States. One day I found out what was really important in prison. On this particular Friday, the director told me I had to shorten my class by half an hour. “There’s a group from the state government in Madison coming to inspect the school and it has to be cleared of all inmates. (I wondered why a school should be cleared of its students for an inspection, but I kept my mouth shut.) Instead of two hours, I would only have an hour and a half. I accepted this change without complaint. At least I had a class that day. Sometimes I drove up to the prison only to find that the place was locked down. The men were confined to their cells and there would be no class. I got the class started quickly and launched into our plan for the day. After forty-five minutes a young security guard opened the door of the classroom, walked in and, without even a nod to me, interrupted what I was saying and told the men to get out. I have spent a lot of my life in school. From the nuns at St. Ann’s to the professors at the University of Wisconsin, everyone held the classroom as inviolate. No one could barge in on a class as this guard had just done. Besides – we had forty-five minutes left. “We have another forty-five minutes,” Walter said. “The State Inspection Team is due at 10:30,” Brian added. Jim looked worried and began to fidget. “The director of education…” I began. Nobody moved. “You got no right,” Walter muttered. What could I say? I had no threat to deliver. If I said I was walking out and would never teach again, his response would have been indifference. After fifteen minutes of listening to him give me public relations, I left, defeated. Security was king. I was powerless. Funny. 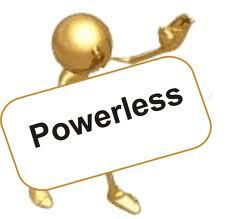 That’s the word convicts use to describe their situation – powerless. Are convicts powerless? Why do many of then think they are? Why do so many staff think this? At a prison I taught at, there was an old man, call him Mr. Carter. Every morning as I came into the prison he pushed a broom along the walkway. The way he walked I knew he was older – I should know, I’m a month short of 77. One day I got talking with him. He told me he was nearing the end of a ten year bit, and they transferred him to a minimum prison. His only daughter called him and told him she was about to have a very serious operation the next day. Mr. Carter walked out of the prison the next morning and walked to the nearest city where he could catch a bus. But as he walked, he realized he’d made a mistake, so he turned around and walked back to the prison. Did they thank him for returning? Did they take him to the hospital to see his daughter? Did they warn him not to do it again? None of those things. They added time to his sentence for escaping. I think Mr. Carter could have made a case that he was worried and confused and should receive no punishment. 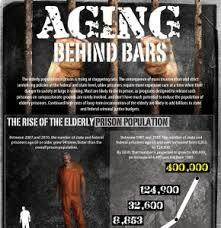 I’m wandering off the subject I want to talk about – the aging in prison. I think about myself – dependent on my family doctor and on prostate cancer specialists. 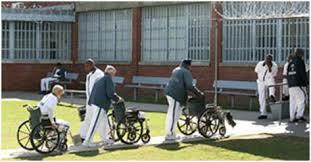 Old people need doctors, but medical care in prisons is very second rate. Another inmate I know has to wait months to see a specialist. This is health care build on cost and on the availability of guards to take an inmate to a doctor. I received an excellent website from a group in the States. It’s called Aging Behind Bars. I wanted to bring some of their data over to my website, but my technology failed me. Please take a look at their website. If clicking it doesn’t work, paste it into your browser. I don’t know what I can do about this problem. Any suggestions?